Imagine this scenario: A professor gives a three hour lecture to his students. Imagine still that none of the students memorized this speech of the professor or wrote it down. Now forty years after that speech, if these same students decided to replicate professor’s complete speech word for word, would they be able to do it? Obviously not. Because the only two modes of preservation historically is through writing and memory. Therefore, for any claimants to proclaim that their scripture is preserved in purity, they have to provide concrete evidence that the Scripture was written in its entirety AND memorized in its entirety from the time it was revealed to our time, in a continuous and unbroken chain. If the memorization part doesn’t exist parallel to the written part to act as a check and balance for it, then there is a genuine possibility that the written scripture may loose its purity through unintentional and intentional interpolations due to scribal errors, corruption by the enemies, pages getting decomposed etc, and these errors would be concurrently incorporated into subsequent texts, ultimately loosing its purity through ages. Now, of all the religions that have scriptures, does any one of them possess their scriptures in its entirety BOTH in writing AND in memory from the day of its revelation until our time? None of them fit this required criteria, except one: This unique scripture is the Qur’an – revelation bestowed to Prophet Muhammad (peace be upon him) 1,444 years ago, as a guidance for all of humankind. ‘In the ancient times, when writing was scarcely used, memory and oral transmission was exercised and strengthened to a degree now almost unknown’ relates Michael Zwettler. It was in this ‘oral’ society that Prophet Muhammad (S) was born in Mecca in the year 570 C.E. At the age of 40, he started receiving divine Revelations from the One God, Allah, through Archangel Gabriel. This process of divine revelations continued for about 22.5 years just before he passed away. Prophet Muhammad (S) miraculously memorized each revelation and used to proclaim it to his Companions. Angel Gabriel used to refresh the Quranic memory of the Prophet each year. The Prophet himself use to stay up a greater part of the night in prayers and use to recite Quran from memory. Many Quranic memorizers (Qurra) were present during the lifetime of the Prophet and afterwards through out the then Muslim world. Currently both in the Muslim and non-Muslim countries thousands of schools with each instructing tens of hundreds of students the art of memorizing the entire Quran. In the city of Chicago itself, there are close to 40+ Mosques, with many of them holding class for children instructing them the art of Quranic memorization. Muslims recite Quran from their memory in all of their five daily prayers. It’s a tradition among Muslims that before any speech or presentation, marriages, sermons, Quran is recited. Quran is the only book, religious or secular, on the face of this planet that has been completely memorized by millions. These memorizers range from ages 6 and up, both Arabic and non-Arabic speakers, blacks, whites, Orientals, poor and wealthy. 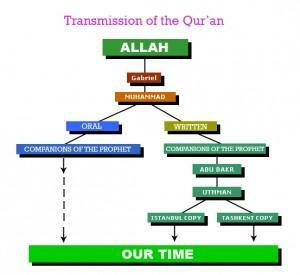 Thus the process of memorization was continuous , from Prophet Muhammad’s (S) time to ours with an unbroken chain. Prophet Muhammad (S) was very vigilant in preserving the Quran in the written form from the very beginning up until the last revelation. The Prophet himself was unlettered, did not knew how to read and write, therefore he called upon his numerous scribes to write the revelation for him. Complete Quran thus existed in written form in the lifetime of the Prophet. Whenever a new revelation use to come to him, the Prophet would immediately call one of his scribes to write it down. The complete Quran was written down in front of the Prophet by several of his scribes and the companions possess their own copies of the Quran in the Prophet’s lifetime. However the written material of the Quran in the Prophet’s possession were not bounded between the two covers in the form of a book, because the period of revelation of the Qur’an continued up until just a few days before the Prophet’s death. The task of collecting the Qur’an as a book was therefore undertaken by Abu Bakr, the first successor to the Prophet. At the battle of Yamama (633 CE), six months after the death of the Prophet, a number of Muslims, who had memorized the Quran were killed. Hence it was feared that unless a written official copy of the Quran were prepared, a large part of revelation might be lost. Now, a committee was formed to under take the task of collecting the written Quranic material in the form of a book. The committee was headed by Zaid bin Thabit, the original scribe of the Prophet, who was also a memorizer of the complete Quran. The compilers in this committee, in examining written material submitted to them, insisted on very stringent criteria as a safeguard against any errors. This copy of the Quran, prepared by the committee of competent companions of the Prophet (which included Memorizers of the Quran) was unanimous approved by the whole Muslim world. If they committee would have made a error even of a single alphabet in transcribing the Quran, the Qurra (memorizers of the Quran) which totaled in the tens of hundreds would have caught it right away and correct it. This is exactly where the neat check and balance system of preservation of the Quran comes into play, but which is lacking for any other scripture besides the Quran. The Quran was originally revealed in Quraishi dialect of Arabic. But to facilitate the people who speak other dialects, in their understanding and comprehension, Allah revealed the Quran finally in seven dialects of Arabic. During the period of Caliph Uthman (second successor to the Prophet) differences in reading the Quran among the various tribes became obvious, due to the various dialectical recitations. Dispute was arising, with each tribe calling its recitation as the correct one. This alarmed Uthman, who made a official copy in the Quraishi dialect, the dialect in which the Quran was revealed to the Prophet and was memorized by his companions. Thus this compilation by Uthman’s Committee is not a different version of the Quran (like the Biblical versions) but the same original revelation given to the Prophet by One God, Allah. Again a very stringent criteria was set up by this Committee to prevent any alteration of the Revelation. When the final recension was completed, Uthman sent a copy of it to each of the major cities of Makka, Damascus, Kufa, Basra and Madina. The action of Uthman to burn the other copies besides the final recension, though obviously drastic, was for the betterment and harmony of the whole community and was unanimously approved by the Companions of the Prophet. It can now be proclaimed, through the evidences provided above, with full conviction and certainty that the Prophet memorized the entire Quran, had it written down in front of him through his scribes, many of his companions memorized the entire revelation and in turn possess their own private copies for recitation and contemplation. This process of dual preservation of the Quran in written and in the memory was carried in each subsequent generation till our time, without any deletion, interpolation or corruption of this Divine Book. ‘We* (Allah) have, without doubt, send down the Message; and We will assuredly Guard it (from corruption)’ (Quran – Chapter 15, Verse 9). Compare this divine and historical preservation of the Quran with any literature, be it religious or secular and it becomes evident that none possess similar miraculous protection. And as states earlier, a belief is as authentic as the authenticity of its scripture. And if any scripture is not preserved, how can we be certain that the belief arising out of this scripture is divine or man made, and if we are not sure about the belief itself, then our salvation in the hereafter would be jeopardized. Thus this above evidence for the protection of the Quran from any corruption is a strong hint about its divine origin. We request all open hearted persons to read, understand and live the Quran, the ‘Manual for Mankind’. 1. Michael Zwettler, The Oral Tradition of Classical Arabic Poetry, p.14. Ohio State Press: 1978. 2. Transmitted by Ibn Abbas, collected in Sahih Al-Bukhari, 6.519, translated by Dr. Muhammad Muhsin Khan. 3. Transmitted by Abu Hurayrah, collected in Sahih Al-Bukhari, 6.520, translated by Dr. Muhammad Muhsin Khan. 4. Transmitted by Uthman bin Affan, collected in Sahih Bukhari, 6.546, translated by Dr. Muhammad Muhsin Khan. 5. Jalal al-Din Suyuti, ‘Al-Itqan fi-ulum al-Quran, Vol. I, p. 124. 6. Ibn Hisham, Sira al-nabi, Cairo, n.d., Vol.I, p. 206. 9. Labib as-Said, The Recited Koran, tr. Bernard Weiss, M.A.Rauf, and Morroe Berger, The Darwon Press, Princton, New Jersey, 1975, pg. 58. 10. Ibn al Jazari, Kitab al-Nash fi al-Qir’at al-Ashr, Cairo, al-Halabi, n.d._ vol. 2, p. 254; also Ahmad Makki al-Ansari, al-Difa’ ‘An al-Qur’an. Cairo, Dar al-Ma’arif, 1973 C.E., part I, p. 120. 11. Labib as-Said, The Recited Koran, tr. Bernard Weiss, M.A.Rauf, and Morroe Berger, The Darwon Press, Princeton, New Jersey, 1975, pg. 59. 12. John Burton, An Introduction to the Hadith, Edinburgh University Press: 1994, p. 27. 13. Kenneth Cragg, The Mind of the Qur’an, George Allah & Unwin: 1973, p.26. 14. Tirmidhi, Mishkat al-Masabih, No. 5823. 16. Suyuti, Itqan, I, p. 99. 17. M. M. Azami, Kuttab al-Nabi, Beirut, 1974. 18. Muslim, III, No. 4606; also 4607, 4608; Bukhari, 4.233. 19. Ibn Hisham, Sira al-nabi, p. 651. 20. Suyuti, Itqan, I, p. 62. 21. Ibn Abi Dawud, Masahif, p. 14. 22. Bayard Dodge, The fihrist of al-Nadim: A Tenth Century Survey of Muslim Culture, New York, 1970, pp. 53-63. 23. Imam Malik, Muwatta, tr. M. Rahimuddin, Lahore, 1980, no.307, 308. 25. Labib as-Said, The Recited Koran, tr. Bernard Weiss, et al., 1975, p. 21. 26. Ibn Hajar, Fath, Vol. IX, p. 10. 30. Ibn Hajar, Bath, IX, p. 15. 31. Suyuti, Itqan, Vol.I, p. 59. 33. Naysaburi, al-Nizam al-Din al-Hasan ibn Muhammad, Ghara’ib al-Quran wa-ragha’ib al-furqan, 4 vols., to date. Cairo, 1962. 34. Ibn Abi Dawud, p. 12. 35. Zarkashi, al-Badr al-Din, Al-Burhan fi-ulum al-Quran, Cairo, 1957, vol. I, p. 240. 36. Fred L. Israel, Major Peace Treaties of Modern History, New York, Chelsea House Pub., Vol. II, p. 1418. 37. Makhdum, op.cit., 1938, p. 19. 38. Ahmad Von Denffer, Ulum Al-Qur’an, revised ed., Islamic Foundation, 1994, p. 63. 39. The Muslim World, vol. 30 (1940), pp. 357-8. 40. Ahmad von Denffer, Ulum Al-Quran, revised ed., Islamic Foundation, 1994, p. 63. 42. Sir Williams Muir, Life of Mohamet, vol.1, Introduction.